Antonio Margil (18 August 1657 – 6 August 1726) was a Spanish (American) Franciscan missionary in North and Central America. He always walked barefooted, without sandals, fasted every day in the year, never used meat or fish, and applied the discipline as well as other instruments of penance to himself unmercifully. He slept very little, but passed in prayer the greater part of the night, as well as the time allotted for the siesta. 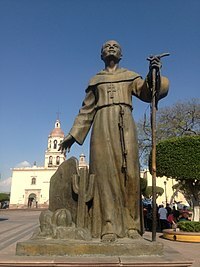 On 25 June 1706, Margil was appointed first guardian of the newly erected missionary college of Guadalupe, Zacatecas. In 1716 he led a band of three fathers and two lay-brothers into Texas, and founded the missions of Guadalupe among the Nacogdoches, Dolores among the Ays, and San Miguel among the Adays. When the French destroyed these missions, Father Margil withdrew to the Rio San Antonio (San Antonio River), and remained near the present city of San Antonio, Texas for more than a year. There he established Mission San José (Texas) to serve the Coahuiltecan Indians. He then returned with his priests to the scene of his former activity, restored the missions, and gave his attention to the French settlers in Louisiana. In 1722 he was elected guardian of his college; at the close of his term of office he resumed missionary work in Mexico. He died at Mexico City in the Convento Grande de San Francisco. SHEA, Catholic Church in Colonial Days (New York, 1886). This page was last edited on 17 October 2018, at 12:24 (UTC).